Also, Bayon TV and CTN have been requesting donations since the early morning of the 23rd for local disaster relief. Donations, which will be distributed to victims and their family, are accepted through representatives of the 10 universities in Phnom Penh and will be transferred to officials in charge of stampede victims committee. 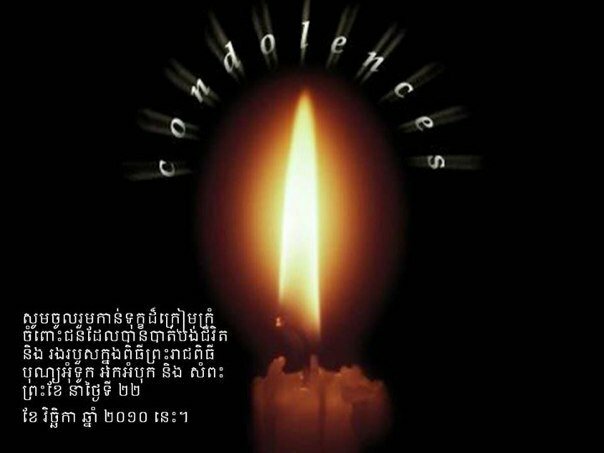 A condolence parade was scheduled for 25th November from Independence Monument to Koh Pich starting at 5:00pm. This list will be updated regularly and was originally posted by Phatry Derek Pan on Facebook. On January 01 2011 This post will move to a static page: http://jinja.apsara.org/koh-pich-stampede-resources/. Both blog post and static page will contain the same information. We will be deleting some of the finished events shortly.